Writer/director Ron Shelton understands the way that people — especially men — communicate through competition that can be both amiable and cutthroat at the same time. And he knows how funny it is to watch. 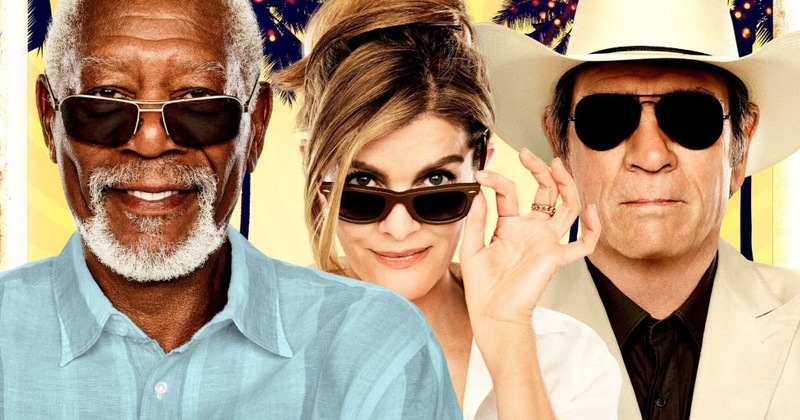 In his new movie, “Just Getting Started,” Morgan Freeman, Tommy Lee Jones, and a cast of great character actors play residents of an idyllic retirement community in Palm Springs who try to top each other in golf, poker, and the affections of a new arrival played by Rene Russo. In an interview, he talked about the differences between men and women, spending Christmas in the desert, and And he quoted one of his most famous characters, “Bull Durham’s” Annie Savoy. One of the funniest characters in the film is the mob wife played by an unrecognizable Jane Seymour. What did you have in mind with the look of her character? She’s supposed to be outrageous. Jane said she wanted to come in and have some fun, and she told me she had two different wigs; one blonde, one brunette. I said, “Bring them both and wear one in each scene.” She’s a woman who married into a criminal wealth and we wanted to have fun with it. It’s unusual to see a movie with Christmas in the California desert, no snow, no pine trees. I’m a native of Southern California so I grew up with Christmas at the beach. I looked it up and Southern California is on the same latitude as Bethlehem so I’ve always joked about that but half the world has hot Christmases. I was in Palm Springs one time around Christmas and it was one hundred ten degrees and there were dust storms blowing and Johnny Mathis was singing “Let It Snow” and everybody was perfectly happy so I thought it was a good backdrop for not your normal Christmas setting. Your films often feature guys and their relentless competition, even in the smallest of ways. Why do they do that? 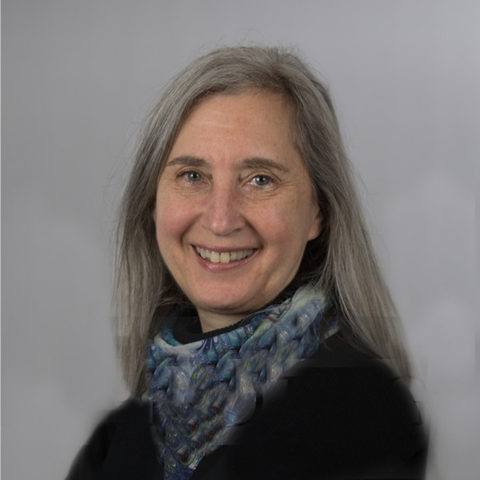 Is it different to write for older characters? It turns out to be the same because I’m an older character and I don’t think of myself as older, so they don’t either. You and I are still thinking about what are we doing next, about doing what are we doing today, what’s my next job, my interview, my script, my movie, whatever. I’m more active than I’ve ever been. I can’t jump as high or hit a golf ball quite as far, but I think I’m a lot wiser. I don’t make as many of the same mistakes. I’m a better parent and grandparent. I wanted to treat them like people and not go to all those usual sort of go-to default reflex Viagra jokes. They’re toasting the Christmases to come, looking ahead, not back. So are the actors. Morgan’s eighty, Tommy seventy. Nobody in the movie was under sixty except the two young kids and everybody was active and vibrant and full of energy. You have made some classic sports movies, and of course there is some golf in this one. We don’t get those adoring portrayals of athletes you see in Turner Classic Movie films like “The Stratton Story” and “Pride of the Yankees.” Why is that? I think we know too much. Television and iPhone and video cameras and paparazzi and confessions mean we cannot pretend that these people are anything other than the brilliantly talented and flawed people they are. Back when those movies were made there were no televised sports. People didn’t know what the athletes looked like. All I try to do in my stories is put the camera and the story where the television cameras can’t go. Do sports build character, reveal character or both? Both; without question. I’m a big believer in sports. It’s great training for people, I know it’s a cliché but it’s true — you learn life lessons. People ask me “what did you learn from sports?” because I went to college on a basketball scholarship and played professional baseball. I say, “you learn to lose” You never win in sports. You have good years and bad. You deal with disappointment. You learn to figure out, “How does that make me stronger? How do I put it in perspective with everything else going on in my life?” So, that’s a great life lesson. It’s what you keep in your heart and mind as you play, whether you are eight years old or thirty or sixty. 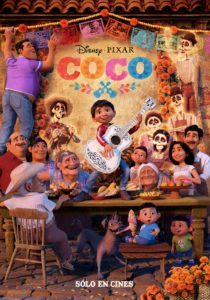 I had a wonderful time interviewing two of the people behind Pixar’s wonderful new movie, Coco. For rogerebert.com, I interviewed co-director Adrian Molina. So much of this film is about family and the importance of family and being connected to your family. A good part of my upbringing as a Mexican-American was in a multi-generational family and there are challenges when you have a household full of kids and adults and elderly people, and sometimes those challenges are age-related disabilities like dementia or limited mobility. Being upfront about those things really brings into focus the value of that family connection that even when it’s hard, the thing that you hold on to are those family relationships and the fact that you are there for each other. I love that Miguel lives in this multi-generational family and he’s got a great-great grandmother. 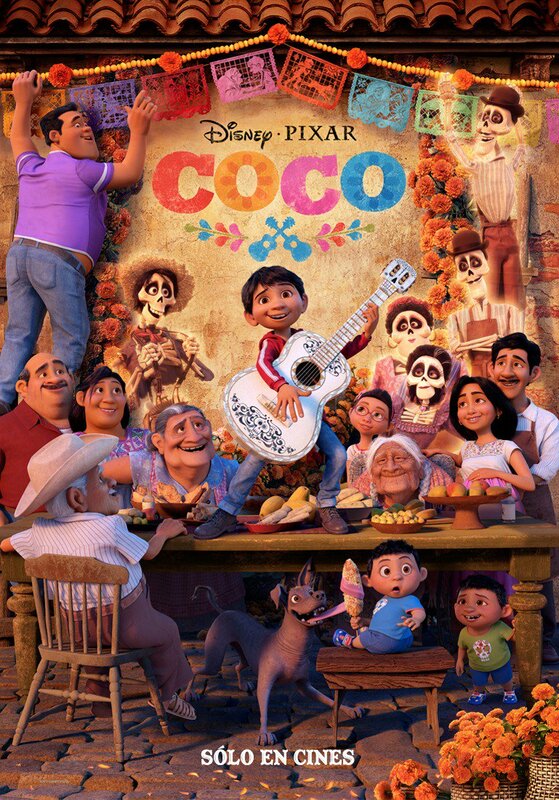 He describes it “sometimes Mama Coco forgets things but that’s okay I still tell her everything” because it’s important to feature the hard parts of being a family. That is what makes it all worthwhile; those show us what it means to be there for each other through thick and thin. And on Where to Watch, I interviewed Jason Katz, the story supervisor. Like you, a lot of the people at Pixar have been there for a long time, and I feel like we’ve moved through their lives with them, from the sibling rivalry to growing up, having your children grow up, retirement, and now death. You’re absolutely right. The Toy Story films are a perfect example. The first one is about jealousy and the fear of not being the favorite, and then the third one is about saying goodbye to your kids as they go off to college. That’s exactly what was happening in the lives of our creative leadership. It’s so funny – there’s all the work we’re putting into trying to craft these stories, but if you step back there’s a fascinating college dissertation to be written about the lives of our directors and our creative leaders and how that is reflected in our films. Next PostNext My Favorite Thanksgiving Movie: What’s Cooking? R.J. Palacio’s book Wonder is more than a best-seller — it is a movement. Middle-schoolers and their families love the story of Auggie, a 10-year-old with facial deformity who for the first time attends school in 5th grade. It is not a story about triumphing over disability; Auggie has more than triumphed when the movie begins. It is instead a heightened exploration of universal themes. In middle school, the moment when people are most acutely aware of differences and most excruciatingly anxious about fitting in, a boy who is very different arrives. The book and the movie it inspired are about family and friendship and, above all, the importance of choosing to be kind. The movie opens November 17, 2017. 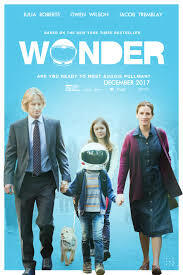 In an interview, Palacio and the film’s director, Stephen Chbosky talked about what kindness means to them and why it is so important to include not just Auggie’s point of view but the other characters’ as well. RJ, as you’ve spoken to kids in schools, what have they told you about the impact that this book has had on their lives and the choices that they make? RJP: I’ve spoken to probably hundreds of schools at this point and thousands of kids. It’s very gratifying and very moving to hear ten year olds and eleven year olds come up to you and say, “I want to be a better person after reading this book.” You think, “Well, you’re ten years old and you’re probably an amazing person already,” but to hear them say that is so moving. I tend to be an optimist in life and I tend to believe that there is an inherent goodness in most people. Kids to me have this wonderful urgent and earnest willingness to be noble. I think our job as parents and as educators and as teachers is to tap into that inherent wanting to be noble. I don’t know if they would call it nobility but I see it that way. Most kids just really want to get along. They want to make other people feel better. They’re mischievous sometimes and sometimes, yes, they border into cruelty sometimes just because they’re feeling like they want to be funny or they’re navigating these uncharted waters. They haven’t had a lot of practice at being a fully realized human being yet and then as they’re growing up, when they’re ten or eleven it’s really kind of the first time that they’re actually exploring the power that they have to reach out and be friends with people and what being an enemy means. So they’re discovering all of this and as parents we can guide them a little bit. At that age what’s happening sometimes is that parents tend to step back a little bit and think, “Well, she doesn’t listen to me anymore, she’s twelve years old,’ but my feeling is that they’re still listening at that age. Maybe when they’re sixteen or seventeen they stop listening but at twelve or thirteen they might pretend that they’re not but they’re still listening. SC: Let me jump in for a second here and add something to that because I think it’s very profound. We all know Lord of the Flies, where kids left on their own become brutal. How many times have you heard an adult say “Kids can be cruel?” Well, kids can also be kind and there is ample proof of both and yet for whatever reason adults on some level like to emphasize how cruel kids can be. I’ll tell you a quick personal story. I have not thought of this in thirty years but I just thought of it right now. When I was in fifth grade we started to work on public speaking in school and so we would have to stand in front of the class. One kid per morning would have to lead the assembly. This girl every time it was her turn she cried uncontrollably because she was so frightened of standing in front of us all. You would think that if kids are cruel (and let’s go with that premise for a second) we would be so mean to this girl. Every month (I’m actually kind of getting choked up remembering this) we would root for her. It didn’t matter who you were. We were all: “Come on Betsy, you can do it this time” and on the last day her voice was quaking but she didn’t cry. I never forgot it…I’m having a moment right now, remembering it. That’s what kindness can do. The story itself is extremely kind in exploring the perspectives of different characters, including Auggie’s older sister, Via, something you’ve continued, RJ, in a book called Auggie and Me. Why is that important? RJ: In order to tell Auggie’s story from a 360° point of view, for us to understand the impact that he had on his community, on his friends, on the school, I had to leave his head and I had to go into different perspectives. His sister was the first one that I really wanted to explore. I just figured here is a girl who was fiercely protective of her brother, she’s a good girl but as just a matter of fact she has to be by necessity the one that’s overlooked a little bit in her family. She’s sort of like a self-cleaning oven. She’s self-sufficient. The parents don’t have to spend a lot of time worrying about her. They can spend most of their time worrying about her little brother who actually needs them to worry him. So I thought going to the different perspectives was a really good way of telling Auggie’s story but also having people understand that everybody’s got a story to tell. Everybody has something about ourselves that we can change or that we worry about. I wanted kids to realize that maybe Auggie’s difference is the most obvious but every single character and every single person you meet has something that they think makes them different and each has to carry their own little challenges and little burdens. We just might not be able to see them as clearly. The story really is about friendship, set in a time when friendships become so vital and so fraught. SC: We all know that when you’re young your friends become become your family more than in any other time in life. So it amplifies what an act of kindness can mean. When you are a kid you are much more vulnerable and so everything becomes more important and everything sounds a little louder and everything hurts a little deeper and I think that’s what’s so powerful about RJ’s story. RJ: I think of kindness as sort of a compilation of several different words — compassion, empathy, tolerance, love, forgiveness. It’s all of those things mashed up into one word which is kindness. It’s something that makes us human in a way that nothing else, though it is so hard to achieve kindness sometimes. It’s one of the most gratifying things in the world to receive and when you receive kindness from someone you’re that much more predisposed to give kindness to someone else. It’s one of the very few things that can actually spread. It’s infectious and it can grow. We’re living in times where kindness itself is almost becoming politicized and being seen as a sign of weakness when to me it’s a sign of strength. The ability to be kind to those who are not empowered or who are being ostracized or being ridiculed or being bullied takes courage. The “precept” Auggie’s teacher gives the class quotes Wayne Dyer, who said, “When given the choice between being right or being kind, choose kind.” But sometimes being right is important, too, isn’t it?Absolutely, yes, and it is a fine line. That’s why I always say it takes a lot of courage to be kind because being right is important too but I think it takes a lot of heart be able to discern when it’s really important to just kind of stay true to your gut about what is needed in life. Given the choice we should all aspire to have both and to win hearts and minds. Whatever it is you do professionally or personally with your family, with your friends or your colleagues we all have the power we all have the capacity to some degree to affect change around us so that the choice doesn’t need to be made. Julia Roberts is so good in this film. The look on her face when Auggie first has a friend who wants to come over has so many emotions at once. What is it like to direct her? It’s like being Michael Phelps’ swimming coach. She is so good at what she does and she can convey every emotion at the drop of a dime, she can change her approach on the drop of a dime, too. Any director will tell you there are two performances; one is the one that the audience gets to see because you’re cutting the best moments together and you’re finding the tone and you’re finding the pacing and the music and everything else, and there’s everything else that you that you left out. She never had a bad take, she was generous to her co-stars, she made everybody better (especially me) and I can’t say enough about her as an artist or a person. Every take was perfect no matter how many ways we tried it. Shorter version originally published on HuffPost. National Geographic’s new series “The Long Road Home” is based on the best-selling book by journalist Martha Raddatz about soldiers sent to Iraq on a peacekeeping mission in 2004 who were ambushed on a day that came to be known as “Black Sunday.” The series is powerful, inspiring, and deeply moving as it lets us into the lives of those who were there and their families. In an interview, Raddatz talked about how she got the story, what she learned, and what she hopes the series, premiering as we prepare to observe Veterans’ Day, will teach us about the people who risk their lives — and give their lives — for our freedom and for each other. The news footage from Vietnam on the news every night played a significant role in eroding the support for the war. We do not see that kind of coverage of what our troops are doing in Iraq and Afghanistan. We did in the beginning. It was it was on all the time and take it from me because I was covering it. But it hasn’t been more recently and never in this way, in the way we tell this story about U.S. soldiers and their families and particularly families. It’s a really realistic, really raw, really warts and all, very nuanced look at war, if you can imagine nuanced war, this has got it. What does nuance mean when you’re talking about war? These aren’t a bunch of action figures. There is lots of breaking down doors and things like that. But they’re also very distinct people, regular people, real people. These are not Navy SEALs. These are not elite forces. These are soldiers who went over there thinking they were involved in a peacekeeping mission and found themselves ambushed and the other men in the battalion who reached out to rescue them in whatever vehicles they could find. Some of them are still serving on active duty, and I can’t remember a time when a series has portrayed soldiers still on active duty. Was that an impediment to you in reporting on the story? Were there a lot of restrictions on what the soldiers were allowed to talk about? They shared everything they possibly could with me. 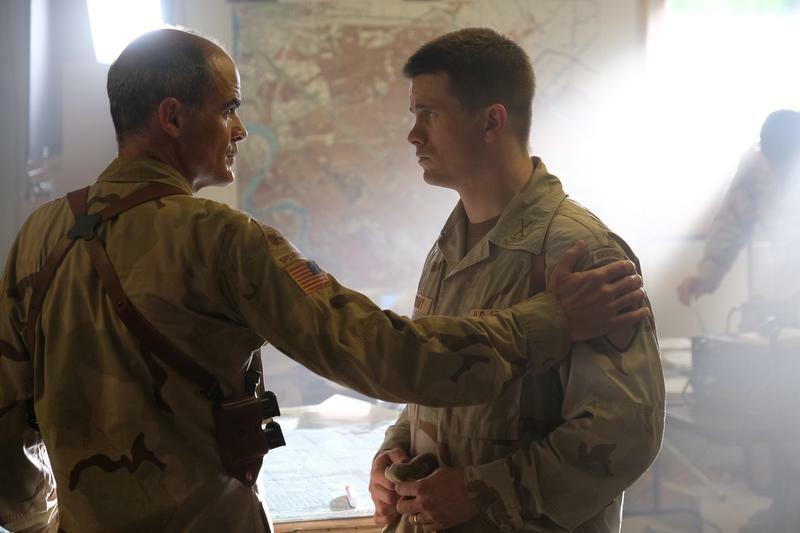 And one of the most remarkable things about this series is that the Army gave it its blessing and cooperated with us. They allowed us to shoot on base and build a 12 acre set with 85 buildings. I think in so many ways right now Americans are ready to see this. And the Army is ready to see this. The Army is ready to say, “This is what we did and this is how we fought. This is where we went into places where we were totally unprepared for what was to come.” They saw everything before we shot it, including scenes with anti-war protesters. There’s an entire episode about a soldier who became a very outspoken war protester. So that is the kind of eye-opening experience you have with this series. We see very clearly in the series that this is a war that’s being fought in the streets and in people’s homes. It’s about as hand to hand combat as you can get. You look each other in the eye. There are some remarkably intimate scenes with soldiers facing down an enemy. What have you learned about courage through reporting and telling this story? Sometimes the people who are most courageous are the ones you never expect to be. You cannot predict it. But I also learned that courage is defined in different ways. It’s not always the ways you think. When we walk into a situation sometimes it takes a little while to find the courage to find that leadership or to find that bravery that keeps them going. Everyone finds it in a different way. And again some people don’t. And that’s the kind of broad spectrum you have. Why was it important for you to talk to the families as well as the soldiers who were directly involved? It’s the soldiers who told me to go talk to family because they said, “If you think it’s bad for us you should see the families and what they went through and what they have to experience and just not knowing.” The soldiers know what’s happening; they know what’s coming next. Those families just have to wait and their courage and their bravery every day, starting with that day of the ambush and years that follow this unit is I think really eye-opening for people. One of the wives would not drive into the garage behind the house without driving by the front of her house first just to make sure there was not a car up there that was going to notify her of her husband’s death. Your work has been in television. What could you do in a book and now in a series re-creating the events that you cannot do in television news? When I first began reporting on the story, we never had was any video. From the descriptions from the soldiers and the survivors of that battle we can see it come to life in the miniseries. It is the first time I’ve seen that come alive. What is it that you want people to talk about with their families after they watch this show? I want people to talk about the cost of war and to understand what it means to go to war. I want people to think about their responsibility to be informed and to have a voice to vote to do whatever it is that involves them in those life and death choices because fewer than one percent of our country serves in the military. Ninety nine percent do not. And the very least people who do not serve can do is understand the consequences. “Lady Bird” stars “Brooklyn’s” Saoirse Ronan as high school senior in 2008, with Laurie Metcalf and Tracy Letts as her parents. Writer/director Greta Gerwig tells the story in pointillist fashion, small incidents along the way illuminating the jubilant dreams, crushing fears, and struggles with parents, friends, and teachers she must navigate as she gets ready to leave home. Her name is Christine, but at an audition for the high school play, she explains that “Lady Bird” is her given name — because she gave it to herself. In an interview, Gerwig talked about the influence of John Hughes films like “Pretty in Pink” and finding the music in the dialogue. You must be thrilled with the enthusiastic reception you’ve been getting from festival audiences. Thank you so much it’s been so extraordinary to be able to take this film to different festivals and talk to audiences all over the country and now the world about it because I’m just always amazed. Everybody’s got a family, everybody’s got a hometown, everybody understands leaving home. It feels like it’s the thing that people can connect to from their hearts which is always my goal and I’m so pleased that people feel that way. 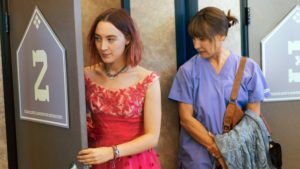 You’ve spoken before about the importance of conveying female friendships and Lady Bird learns some painful lessons about friendship in the film. I’m always interested in relationships between women. In “Mistress America” it’s stepsisters of different generations and in this movie the real love story for me is between this mother and daughter but her relationship with her friend Julie is another element of it. I’m always interested in how women relate to each other, whether it’s a family relationship or it’s a friend relationship. That’s such uncharted territory in cinema. Usually women don’t have any relationship with each other; they just have relationships with the male protagonists. That’s something both what I’m interested in and it’s also something that I’ve taken on quite deliberately in the work that I’ve co-written and now with this movie. Were the John Hughes movies about teenagers an influence for you? I was a big fan of John Hughes movies, particularly “Pretty in Pink,” but they have embedded within them generally an idea of one guy which I philosophically disagree with. I started from the premise of, “What if there were two guys and they are both wrong?” I wanted to honor what’s so wonderful about those films while not actually doing the film. With her romances, I wanted both the satisfaction of the vividness of teenage emotion and falling in love and giving the audience that point of connection, but then also the film knows that that’s not the end all and be all, that the movie that’s playing in her head is different than the movie that she’s in which I think is often true in life. Teenagers are living out some romantic ideal and the reality is that no one’s doing it with them. Christine wears a uniform because she goes to parochial school, but her look is still very distinctive. The parents in the film are beautifully portrayed and they have their own real characters and storylines. I wanted it to ultimately be really the mother’s story as much as it was the daughter’s story because one person’s coming of age is another person’s letting go. Laurie Metcalf and Tracy Letts are both actors that I’ve watched for a very long time and I’ve seen them on stage and Tracy I obviously knew as a writer as well and I knew him to be extraordinary on all fronts. Laurie Metcalf — I’ve never seen her equal on stage; she’s one of the most tremendous actresses I’ve ever witnessed performing. What I loved about both of them was that they both have theater backgrounds. The same is true of course for Lois Smith and Stephen McKinley Henderson. Theater people are my people. Tracy and Laurie have known each other for twenty years and there was something about the Midwesterness of them that felt right for a story about Sacramento. With every scene particularly between Laurie and Saoirse, I wanted the audience to feel like, “I get where that mother is and I get where that daughter is.” Even if Laurie says the wrong thing or Saoirse is being a jerk you don’t feel like ultimately that’s who either of them are. You just feel like they’re struggling through this difficult time. Even if you can’t figure it out, the time itself is relentless which adds to the anxiety. You’re very precise in your dialogue, so what kind of collaboration were you doing with them and how did they change your understanding of the characters you created? I think the thing I’m always listening for as a writer and director is for it to be in the right rhythm, different than I’d heard but played the same tempo. I’d know I hit it when it surprises me but it also feels right. I keep going to something that feels musical because that is really how it is for me. You’ve worked with quite a range of directors as an actress. What kinds of ideas did you take from the way they approach the material that helped you in your first time as a solo director? One of the great advantages of my time spent in movies and in basically every role possible both in front of the camera and behind the camera that I’ve gotten to see all these different ways that people work and the way movies are constructed from the inside out, from beginning to end. Because I didn’t go to film school this was really my training; everything from tiny things to big things. From Mike Mills I took the idea that everyone on the crew who is not an actor, including me, wears a nametag every day. It sounds small but it’s actually huge because as a director you’re with your crew the whole day but actors are really only brought in when the scene is completely lit and ready to go and they don’t have as much of an opportunity to really get to know all the gaffers or grips or the boom operator and sometimes those people switch out. Being able to call them by their names instead of just “hey you” is a big deal. From Rebecca Miller I took the idea that the director needs to arrive every day an hour ahead of everyone else and walk through the entire day. They have to be over-prepared so that the actors feel like they have all the time in the world and there is never a feeling that the director is time stressed. From Noah Baumbach I learned to have a strict no cell phone policy on set. If you need to make a phone call or text someone you can step off the set and use it. There is nothing that bums you out more than looking over and seeing somebody on their smartphone and that goes for actors and everyone else. Everybody told me, “Oh, good luck you have so many kids in this movie. How are they ever going to not text?” The truth is they all left their phones in the trailer and I just felt like it made everybody so much more present. An edited version of this interview originally appeared on HuffPost.